MineExcellence is establishing itself as a global leader in drilling and blasting software technology space. Core of our offerings is an Enterprise Platform for Blasting. We offer SaaS and Mobile based platform which provides all intelligence in the hands of average blasters, blast supervisors and senior mine management. The technology helps improve and optimize blasting which can result in significant benefits operationally and eliminate potential risks / problems during blasting. Blast Design, Blast optimization, Blast data collection and Analytics – accessible anywhere anytime in an integrated manner. The platform is currently used by Tier-1 large mining company’s cross mines, small mining companies at individual mines and blasting contractors. Our Platform provides solution for a variety of problems that can occur during blasting such as flyrocks, air/ground vibrations and indications on fragmentation size. Innovative mobile app provides support and flexibility to the person in the field. We also provide a Blasters Management Portal (suitable for use cross mines by senior mine management). Our technology Platform caters for GIS Integrations, AI and drones in the blasting process - New innovation which helps driving substantial productivity benefits in overall mine to mill operations. It is easy to use (No Servers /Backups etc) – You can just register online and start using the platform now! MineExcellence has established itself as a global leader in Blasting Software Technology. We are disrupting this niche area in the mining industry by making high quality blasting technology available to anyone, anywhere anytime. Unique tools for all aspects for blasting - Design, Data Collection and Optimization. Advanced Mobile APP providing an average blaster every capability on their APP itself. Integration with ERP, equipment’s and mine planning systems. 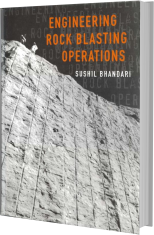 Engineering Rock Blasting Operations has widely been used as a college text book for undergraduate and post-graduate courses in blasting and is authored by our co-founder Dr. Sushil Bhandari. This work provides detailed information about materials needed for carrying out blasting operations such as explosives and related accessories. It also covers various aspects of the blasting lifecycle including understanding of the process of fragmentation, various techniques, design methods and technology applications during blasting.